A school that began at a landlord's courtyard has already managed to stay around for over a century. Taaldighi Multilateral High School in the village of Taaldighi in Phulpur Upazila here is now one hundred and six years old. Late Abdul Jabber Sarker, a well-off person of Taaldighi village took the initiative to give the children of his village education in both Arabic and Bengali. Classes were to be conducted in his baithakghar or drawing room, which was in his courtyard. This was back in 1901. He employed an Islamic tutor to teach the kids of the village. Within a very short time, his 'school' caught the attention of a lot of people who soon came forward to enroll their own children. Abdul Jabber was inspired to expand the school. Quickly, the little baithakghar turned into a primary school, enrolling students up to class five, and then later into a Minor School, admitting students up to class seven. Since 1911 the school has been conducting its academic activities in its present location of Mymensingh-Haluaghat and Mymensingh-Sherpur road. The school is surrounded by many trees and has a large pond in front of it. The scenic location is itself a major attraction to the school. From 1926 to 1945 the school was a Middle English School (ME School) before it was offered government affiliation in 1945 as a High School. As ME School, it was notable for several students obtaining scholarships in the junior level every year. 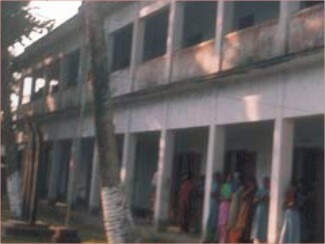 As its reputation spread, students from adjoining villages were also attracted to the school. Md. Nurul Hoque who has served the school for about 30 years as its head explained that the school had gained popularity when Narandra Narayan Acharya, a post-graduate in Commerce, took the charge of the school in 1956. The SSC results were over 80 percent pass-rate and the school got several prizes for its achievements in the last 40 years. Hoque also said that such a facility inside the village was very beneficial to the people of the region since they had to travel on foot. Otherwise, students would have to travel 20 to 30 miles on foot to reach Mymensingh town crossing the Brahmaputra River as the present highway had not yet been built. Abdus Salam Talukder, acting Headmaster and himself a student of the school, is proud of the school's rich past. It started as a high school in 1945 with three groups: Science, Arts and Commerce with more than 1200 students. He said, “being a student of this school, I feel proud and I think the school can move fast if all concerned including the political leaders come forward with their support and suggestions”. The SSC results are currently good: the average result of this school in last two years is over 70 percent pass with two GPA-5s in 2006. The school has a library with a rare collection of books over 70 years old. The books include a couple of atlases published during the British rule. The library now has a collection of some 1000 books but the facilities are not sufficient. Also, there is no reading room. The Headmaster said that the library needs adequate financial support to develop further. Abdul Halim Sarker, son of the school's founder went on retirement from this school as its head. He hopes a better future for this school. "I feel something extra being the son of the founder of this school and I hope my late father would be alive forever through thousands of students of Taaldighi School", he said. Ex-BNP MP from Mymensingh-2 Shah Shaheed Sarwar, a former student of this school also recalls his boyhood days in the school with fondness. The village Taaldighi could be cherished by the people of the region just only for this century-old high school and not for the abundant palm trees or for beautiful ponds.